Hand forged wrought iron offers a charming, traditional look. A dark finish stunningly complements anything that hangs from it, adding elegance and beauty to your home or garden. ✔MULTIPURPOSE. Some of the great uses we have come up with for this hook (some might call it a really big bracket) are: hanging wind chimes, wind spinners, lanterns, bird feeders, bird houses, flower pots, and planters. The possibilities are (almost) endless! 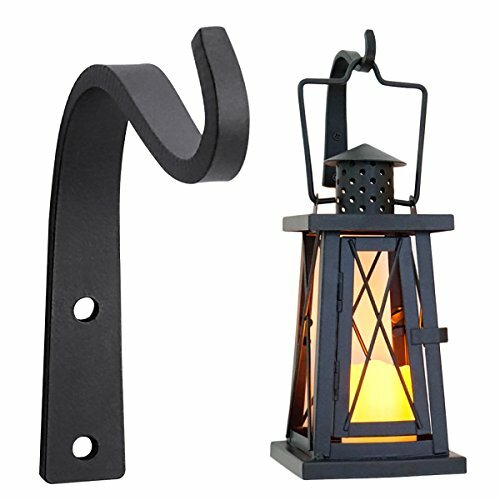 ✔VERSATILE: Screw this lantern wall hook into wood fence posts, deck posts, or even indoor walls. Looks great within a variety of different environments. Curved tip helps securely hold items while adding to the exquisite look. ✔SO EASY TO INSTALL: Simply use the 2 high-strength, coated, black screws that are included with your hook to attach it to a deck, fence, post, wall, or tree. Matching black screws maintain a consistent, sleek look for your garden. With hand forged heavy-duty iron material you know you're getting a long-lasting product that will keep you satisfied for years to come. If you have any questions about this product by APBFH, contact us by completing and submitting the form below. If you are looking for a specif part number, please include it with your message.